Happened to drop by Blu Kouzina for dinner with fellow food-blogger Xinli from the4moose (his post here) about a month back. 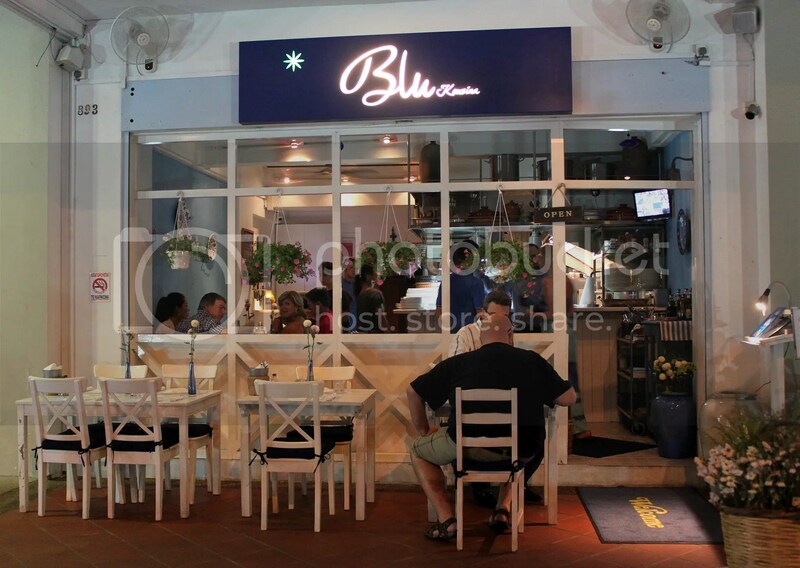 Greek cuisine is rather uncommon in Singapore and this might possibly be the only restaurant that does it (based on a quick google search). 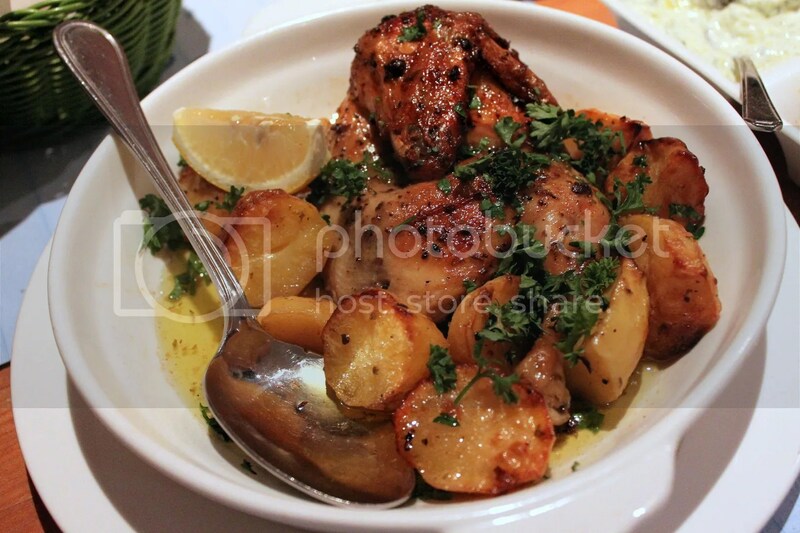 That said, Greek cuisine is a subset of Mediterranean cuisine (which includes North African, South European and Middle Eastern cuisines) so it wouldn’t veer too far off from what our palates are used to, especially if you are comfortable with Mediterranean dips, grilled meats and seafood. 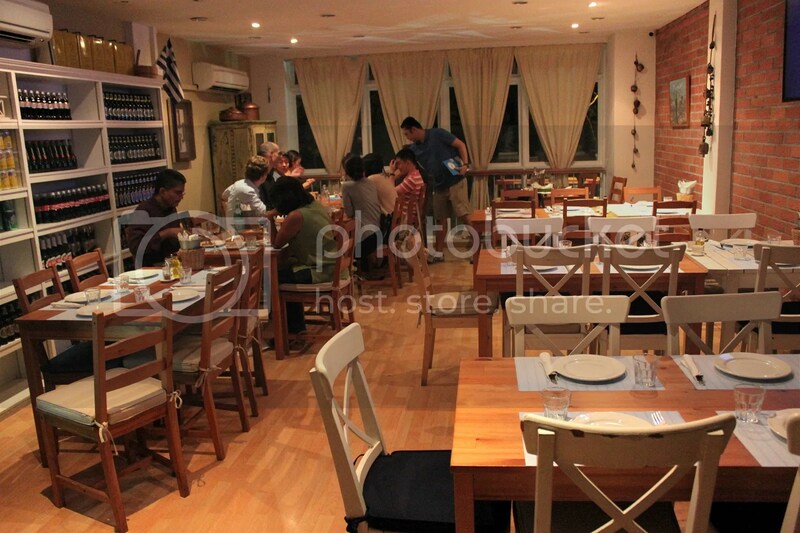 While the restaurant looks rather small from the outside, the seating capacity is actually quite large given that there is a second and third floor as well to accommodate patrons. The staff are really friendly so don’t be surprised if one of them puts their arms around your shoulder halfway during the meal to ask you how’s everything going because this was what really happened to me. Initially, I thought that the guy was trying to pick me up or something (given that I was dining only with another guy and my sexuality might have be miscontrued, plus it was the day after Pinkdot SG) but later realized that this was something he did to other guests as well, leading me to think that this is probably the culture back in Greece where people are so much friendlier. Melitzanosalata ($13.80++) – Smoked eggplant mixed with herbs. I found it very flavourful with a very distinct smoky savoury taste. Tzatziki ($12.80++) – Yogurt mixed with cucumber, extra virgin olive oil and flavored with garlic. Fava ($11.80++) – Yellow lentils with fresh onion, oregano and extra virgin olive oil. The texture held a heavy semblance to beans. 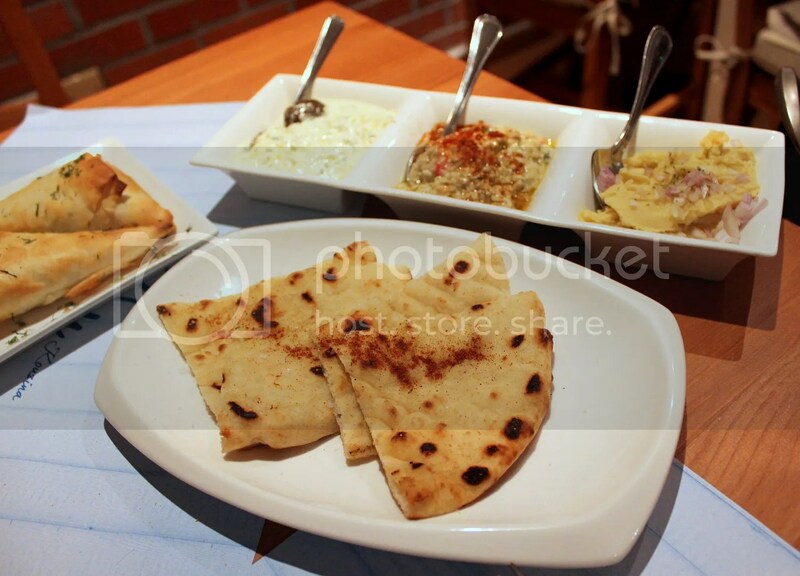 Pita Bread ($3++) is not included and must be ordered separately. It seemed to have been prepared upon order and arrived on our table piping hot which is a plus. 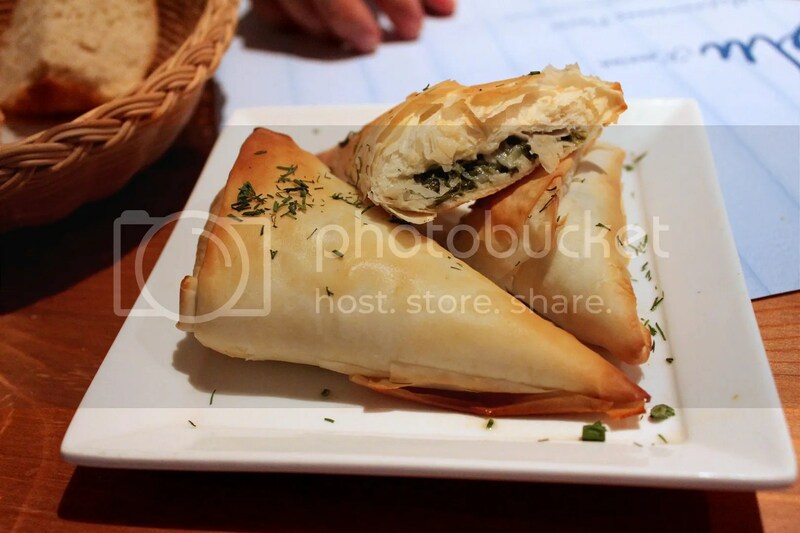 We also tried the Spanakopita ($12.30++), a filo pastry filled with spinach, feta cheese, and herbs. Going by its looks, I initially expected the texture of the pastry to be like a spring roll but soon discovered that it was way thinner and lighter. I would recommend this. For main, Xinli had the Souvlaki me Pita ($19.80++), or Beef kalamaki wrapped in pita bread, with fresh tomatoes and red paprika served with chips. 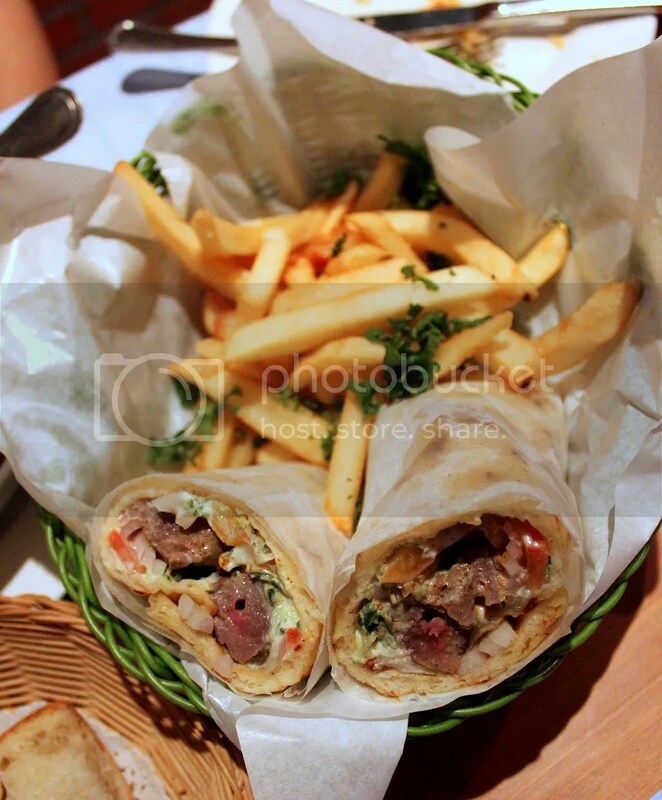 Kalamaki means grilled skewered marinated meat cubes. I usually stay away from such wraps because the grilled meat fillings often turn out dry and rubbery but the one here was actually quite tender, where I could bite a sever off a chunk of beef effortlessly in one chomp with the pita bread, rather than having to tug and pull to tear the meat off. 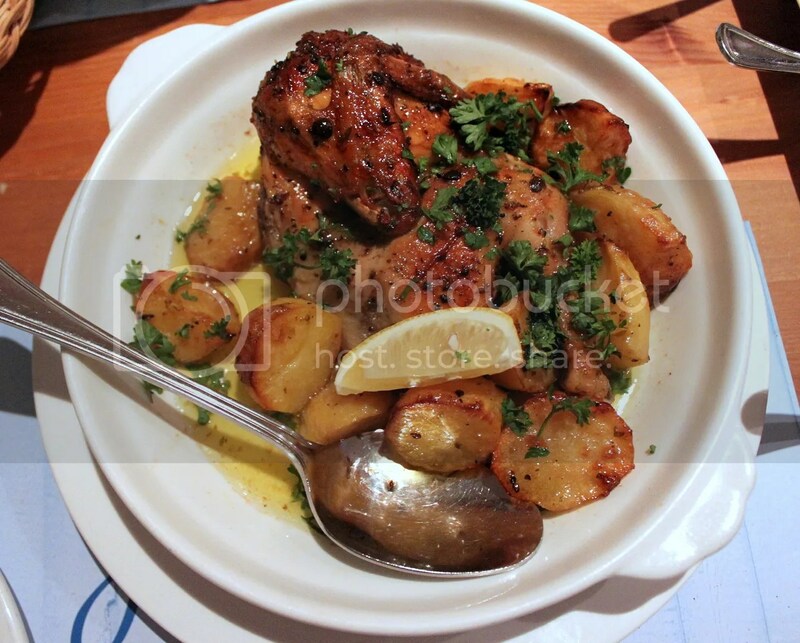 I stuck to a rather safe option, the Me Patates ($22.80++), or half a roast chicken with potatoes, lemon, extra virgin olive oil and oregano. Nothing terribly exciting about it. 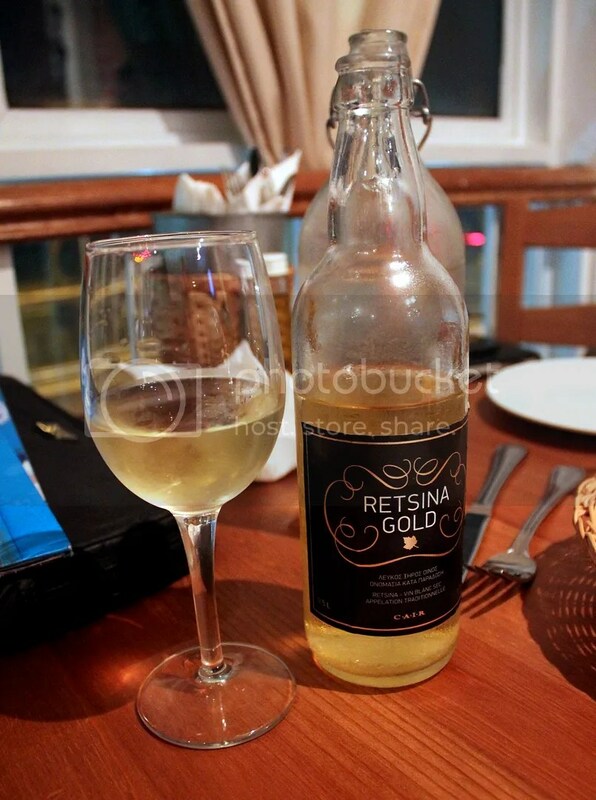 To complement our meal, we had the Cair Retsina Gold ($26.80++/500ml), a traditional type of Greek wine made ​​by adding pine resin into white wine. The pine resin was used in ancient times to increase the storage life of the wines. Personally, I didn’t quite like the pine flavour as I thought it tasted a bit like medicine. Guess it’s more of an acquired taste. Overall, what charmed me most was the ambience of the place. The staff were genuinely friendly and I felt like I had been transported to a cosy little European cottage, where I could truly enjoy an unhurried meal. There’s also the potential plus point of sipping on affordable wines over post-dinner chit chat. Categories : All YumYums in my TumTum, Bukit Timah, Cuisine Type YumYums, Location of YumYum, Mediterranean, Yummy! I like this place too. It makes feel like I am in Greek especially with all the blue white decor. me too. wished the upstair levels had the same blue decor. Ooooo. Thanks for the post! I’m so adding this to my list! you are very welcome! have i met you before? your blog looks great! Hey! I -think- we’ve met briefly once, though I can’t remember when exactly. Lol. Thanks, you’ve got there a really nice blog going as well!